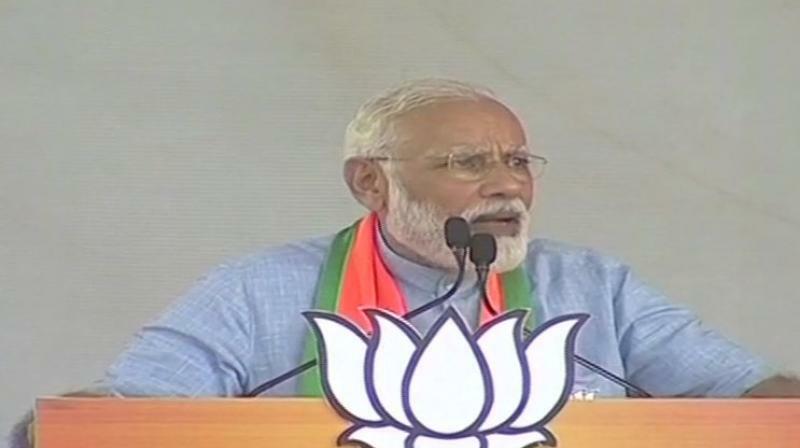 Aligarh: Prime Minister Narendra Modi Sunday said it is due to the strength of Babasaheb Bhimrao Ambedkar's Constitution that a man from a deprived and exploited class is president, a man from a farmer's family is vice president and a 'chaiwala' is the PM. Modi also attacked the opposition alliance in Uttar Pradesh, asking how those not fighting all the Lok Sabha seats in the state can give a prime minister. "It is the strength of Babasaheb's Constitution that a gentleman hailing from deprived and exploited class has become the president (Ram Nath Kovind), while the vice-president ( M Venkaiah Naidu) is from a farmer's family," he said at a rally in Aligarh district, on birth anniversary of BR Ambedkar, the architect of the Constitution. "Thanks to Babasaheb's Constitution, a 'chaiwala' (tea-seller) is holding the prime minister's post," Modi said. In an apparent jibe at the SP-BSP-RLD alliance in Uttar Pradesh, Modi asked, "Those who are not contesting on all 40 Lok Sabha seats (in the state), can they give a prime minister?" In Uttar Pradesh, the Mayawati-led Bahujan Samaj Party (BSP) is contesting 38 Lok Sabha seats, while the Akhilesh Yadav-led Samajwadi Party (SP) has fielded candidates from 37 parliamentary constituencies. There are three Rashtriya Lok Dal (RLD) candidates in the poll fray from the state.